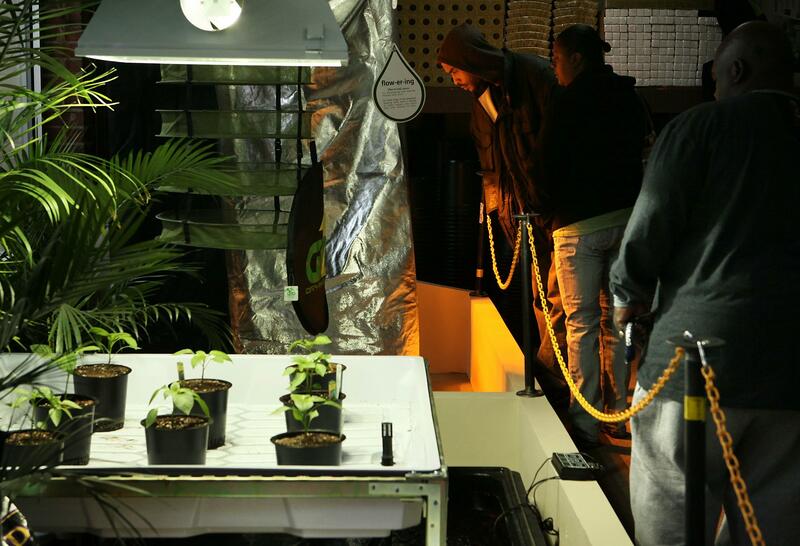 People check out the hydroponic plant-growing system in the weGrow marijuana cultivation supply store during its grand opening March 30, 2012, in Washington, D.C. I spent part of yesterday in a D.C. Council meeting—the one in which legislation to decriminalize marijuana, to turn possession of an ounce into a parking ticket-level problem, sailed through. My story about the battle is here; the most interesting aspect of the campaign is how, for D.C.’s unanimously liberal council, it’s become an issue of racial justice. That’s becoming a bit of a theme, nationally. Prohibitionists have nothing to say about sentencing disparity—they prefer how MSNBC’s Chris Hayes reacted to the laughable David Brooks/Ruth Marcus columns of early January with a pretty powerful monologue about how he got off easy in a situation that would have led to arrest for a black teen. At this point, I’ve “confessed” my recreational use of marijuana twice, so that’s probably enough of that. (I don’t constantly mention my rye and bourbon collection when talking about New York or Kentucky, though I want to.) The point is that a decriminalization bill is likely to pass in D.C. this year, and as of now no member of Congress is fulminating against it.